Travel from Lisbon to Aveiro. Compare and combine trains, buses and carpooling in one search. Find the cheapest tickets. What is the best way to get from Lisbon to Aveiro? Train is the best way to go from Lisbon to Aveiro. It is the fastest and if you find Promo-tickets it is also the cheapest option. Otherwise, bus can be also a good alternative. Car is not recommended, since it is more stressful and much more expensive. Comboios de Portugal is the Portuguese national railway company and operates as much as 18 direct trains per day. The first train departs at 06:30 and the last one at 21:30. 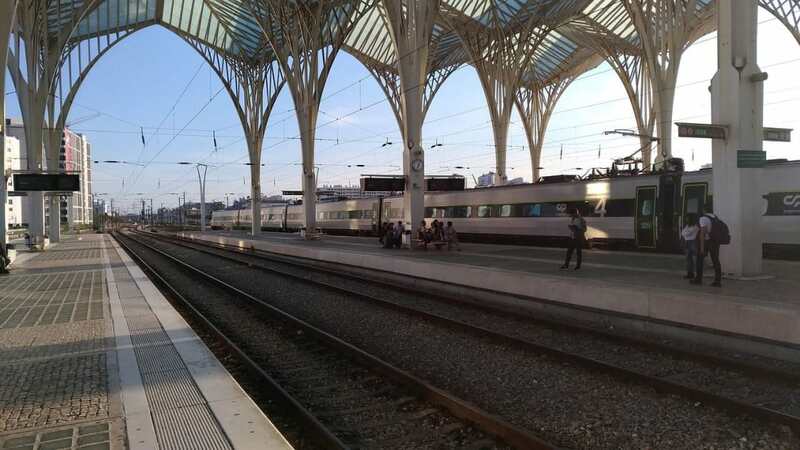 You can also get in the train at Lisboa - Oriente, about 5-10 minutes after the departure from Santa Apolonia. The station of Lisboa - Oriente will be more convenient if you are coming from the airport, since they are connected by direct underground in just 6 minutes. 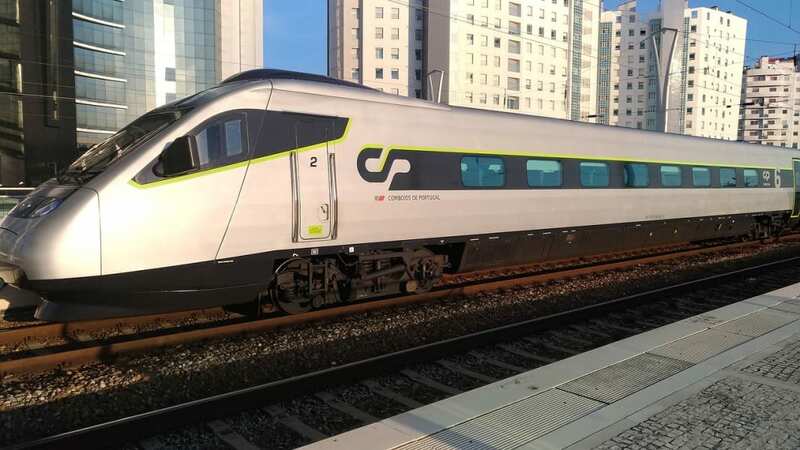 The Alfa Pendular trains (AP) are the fastest ones. They cover the distance from Lisbon to Aveiro in 2 hours and 4 minutes. Standard fare is 27€ for 2nd class and 39€ for 1st class. They have many commodities onboard, including WiFi. When Promo-tickets are available, they usually cost 17€. However, from time to time one can find a Promo-ticket for as less as 10€. Intercidades trains (IC) are about 20 minuts slower, but also cheaper. The duration with these kind of trains is 2 hours and 25 minutes. Standard fare is 21€ for 2nd class and 31€ for 1st class. Promo-tickets, if available, usually cost 13€, but if you are lucky (and check with enough time), you can find some for just 8€. Note that train tickets from Comboios de Portugal are only available for purchase 30 days before departure. The earlier you book, the more chances you have to find a Promo-ticket. The only company operating this route is Rede Expressos. During the week there are 6 buses running daily and for the weekend the frequency increases, as you can see in the timetable. The fastest buses cover the distance in 3h and 15 minutes, while the slowest takes more than 4 hours. The price is fixed at 16€ per way. A distance of 255 km separates Lisbon from Aveiro. This can be covered by car slightly less than 3 hours with normal traffic conditions. A fun alternative to train or bus is car-pooling. With this system you have the chance to meet new interesting people and share the costs of the ride. The biggest platform is BlaBlaCar. A ride usually costs between 14€ and 17€. Unfortunately, only there are not many rides are offered in this route and they are usually available only a few days before departure. Anyway, it might be worth checking just in case. Driving your own car will cost 41€, according to Via Michelin. The cost includes 24€ for fuel consumption and 17€ for tolls. If you don't own a car and you need to rent one, you will have to add also that cost. Renting a basic car in Portugal can be very cheap. However, if you plan to drop the car in a different city from where you picked it up, you will have to pay an additional fee. What can I visit on my way from Lisbon to Aveiro? 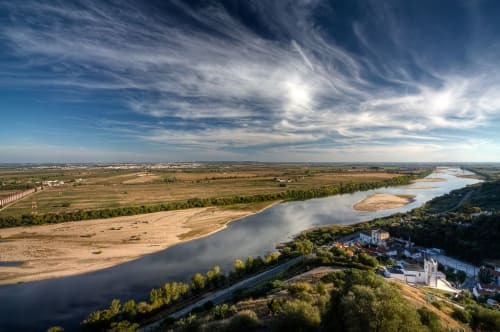 Park with impressive views over the Tagus river and the countryside, next to the village of Santarem. Town with a Dominican Monastery built in 1385. It is a UNESCO World Heritage since 1983. You might also want to check Suntransfers.com, as they have also good reviews on both Tripadvisor and Trustpilot. This option might be especially interesting if you are a large group, as they have Private Minicoaches and Coaches and the price per person will decrease drastically. If you are staying in Lisbon, Aveiro is an ideal place for a day trip. The first train departs from Lisbon at 06:30 and arrives at Aveiro short after 09:00, giving you the complete day to explore the town. If you prefer to wake up a bit later, the are trains departing at 07:00, 08:00 and 09:00 as well, all taking between 3h 15m and 3h 20m. Alternatively, the first bus departs from Lisbon 08:30 and arrives at Aveiro at 12:25, except Mondays, when you will be able to arrive to Aveiro one hour earlier. In order to return to Lisbon, the last train departs from Aveiro at 21:13 and arrives to Lisbon at 23:30, while the last bus departs at 18:15 and arrives back to Lisbon at 21:29. 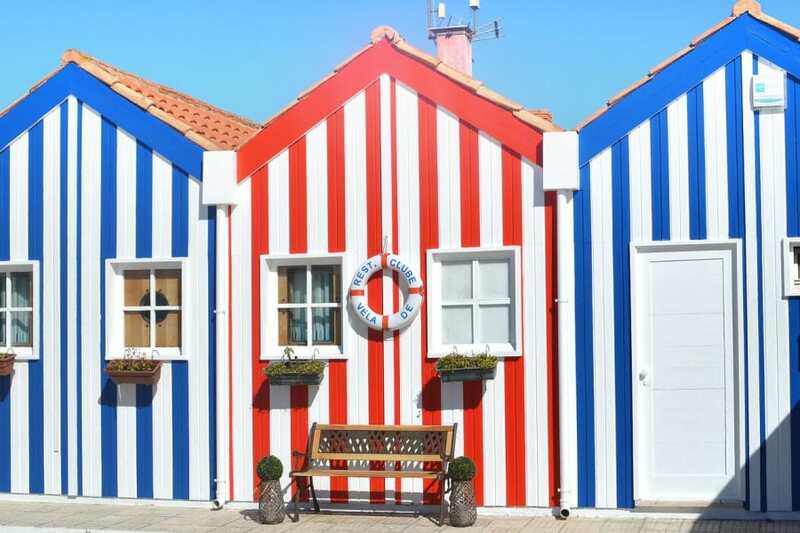 If you are travelling to Aveiro, you might be interested in looking for accommodation. By using the search box below you can find the best prices in several types of accommodation, from low-budget hostels, to appartments and fancy hotels. The sooner you book, the cheaper it will be. In some cases you might have free cancellation under certain conditions! Aveiro, colorful houses. Photo by michelmondadori on Pixabay. Lisboa Oriente station. Photo by LuisFerreira4x4 on Pixabay. Train Alfa Pendular. Photo by LuisFerreira4x4 on Pixabay. 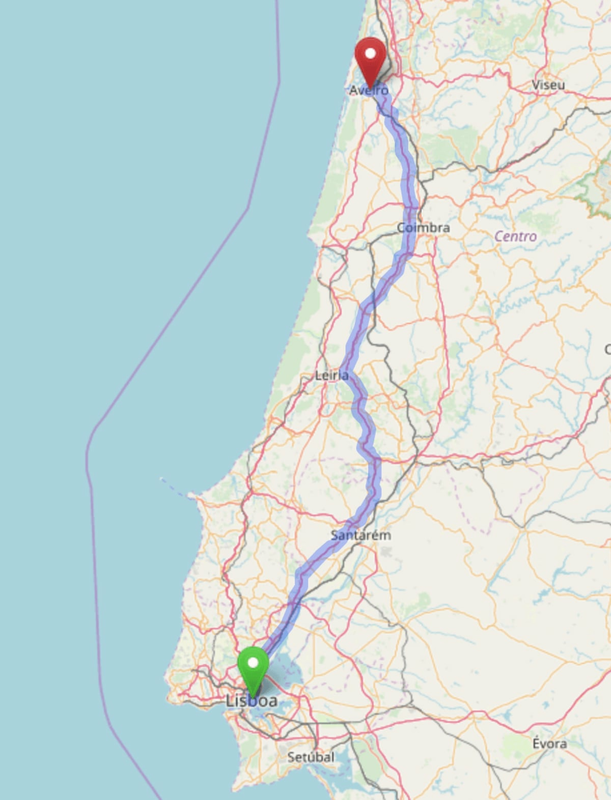 Road map from Lisbon to Aveiro. Source: © OpenStreetMap. Tagus and countryside from Jardim das Portas do Sol. Photo by Paulo on Flickr. 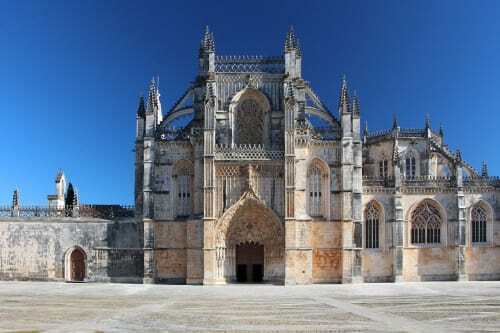 Batalha Monastery. Photo by staand on Pixabay.